St. Barts is one of the few Caribbean islands that has not changed dramatically in the past 30 years. This heavenly island is really more of an eight square mile piece of volcanic rock-turned French nightclub. Every time I have visited, private villas and yachts continue to be the preferred choice among the returning rich and famous. This holiday season there should have been a red carpet and velvet rope set out at the tiny Gustaf III airport for the huge amount of bold faced names arriving by private jet. For New Year's Eve there were many competing parties from the $28,000 per night Eden Roc Villa Rockstar with Leonardo Di Caprio or L.A. Reid's intimate bash at Villa Rox with Marc Jacobs and Rihanna. After 2:00 am many of the famous names including Chris Rock, Lana Del Rey, Jon Bon Jovi, Salma Hayek, Tobey Maguire and Kevin Connolly flocked to Russian billionaire Roman Abramovich and art dealer Larry Gagosian's bash at La Plage restaurant. However, it's not the nightlife or celebrities that draw me to St. Barts, it's the luxury of privacy and relaxation and the fact that the island makes everyone feel like a billionaire. You don't have to be a star to be a part of this show. I was lucky to be hosted by WIMCO Villas and the companies amazing President and COO Stiles Bennet, who provided me with a decadent tour of some of the most amazing villas on the island as well as a luxurious overnight in the massive $55,000 per week Villa Kay. With over 280 villas in the rental program and 70 villas for sale, WIMCO is the best source for St. Bart and St. Tropez visitors looking to find the ultimate property. They also have a global portfolio of 1,300 hand picked private residences. They guide potential buyers to villas that suit their needs and can also help put the property into the rental market if desired. WIMCO's portfolio of villas on St Barts totals over 800 bedrooms, almost double the total of all the hotel rooms on the island! I was picked up in a private car on the quai in Gustavia, where my yacht was moored, and our 24-hour concierge (an exclusive service offered to all WIMCO renters) drove us directly to the villa. WIMCO had dinner catered in the villa upon our arrival and we enjoyed champagne by the massive infinity pool with a few friends from the yacht while listening to the crashing waves on the bay below. Located in Anse des Cayes, WIMCO Villa WV KAY is a contemporary 5 bedroom/5 bathroom luxury villa on the hillside and set within large, beautifully landscaped gardens and is totally private. The main building features two king bedrooms with ensuite baths. The living room and fully equipped gourmet kitchen are strategically placed to take advantage of the view. The other king bedrooms with ensuite baths are each located in a separate bungalow. There are two dining areas; one is located in a gazebo in the garden including dozens of wandering tortoises, and the other is located on the covered terrace which overlooks the gorgeous infinity pool and spacious deck. The following morning I was treated to a delightful massage by Oceanculture on the deck overlooking the gardens and then left for a tour with my private guide Guillaume Bichot to see a few of the best villas available on the island to rent. My favorite by far was the $130,000 per week Villa Vitti, where I hope to stay in the future. 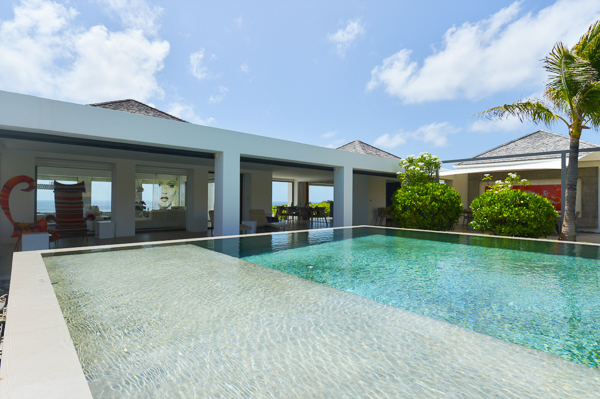 A 5-bedroom villa located above Shell beach, its the newest jewel in the crown of St. Bart. It is a glamorous, luxurious home with spectacular ocean views. This villa has access directly to Shell Beach via 120 steps below which is rare to find on the island. The perfect villa for visitors who arrive by yacht. Villa La Plage, is a dazzling gated estate, ideally situated right on Lorient Beach. With five-bedrooms in the main villa, and two-bedrooms in the cottage, this magnificent $160,000 a week villa comfortably accommodates fourteen guests. A gorgeous arched swimming pool surrounded by a large deck, with sunny and shady lounge areas will inspire guests to sit back, relax, and breathe in the fresh sea air. Villa Casa Del Mar rents for $193,000 per week and is a paradise all to its own away from the maddening crowds where a billionaire could have the ultimate privacy. A 6 bedroom villa comprised of two separate villas in the Petit Cul de Sac area within the Domaine du Levant community on the east side of St Bart's. It is perched on almost 2 acres of private land on the edge of the magnificent cliffs of Petit Cul de Sac and the Atlantic Ocean. It is adjacent to over 20 acres of green zone, raw undeveloped land providing breathtaking views and walking areas. After my tour under a sweltering hot sun I was ready for some refreshment and enjoyed lunch with the gorgeous and well connected publicist for WIMCO, Cecilia Pelloux along with the charming and well respected CEO developer Olivier Dain from Olivier Dain Properties. We spoke at length about the recent sales of homes including the recent listing of actor Steve Martin's $11 million dollar and other high profile billionaires and celebrities who are shopping in the area. He gave me the insight to a massive new villa currently being built for a top secret superstar. It will be the largest villa on the island when completed next year even beating Russian billionaire Roman Abramovitch's $90 million estate. I was reluctant to leave this amazing island full of energy and smiling faces. I felt like a local being welcomed back home and I can't wait to return to this energetic land of beautiful people inside and out. Roman Abramovitch's $90 million compound on Gouverneur Beach in St. Barts.